Despite a decade of intensifying efforts to slow tropical deforestation, tree cover loss has only increased. WRI’s Frances Seymour examines factors contributing to continued deforestation and what can be done about it. There’s no mystery on the main reason why tropical forests are disappearing. Despite the commitments of hundreds of companies to get deforestation out of their supply chains by 2020, vast areas continue to be cleared for soy, beef, palm oil and other commodities. In the cases of soy and palm oil, global demand is artificially inflated by policies that incentivise using food as a feedstock for biofuels. And irresponsible logging continues to set forests on a path that leads to conversion to other land uses by opening up road access and increasing vulnerability to fires. A large portion of that logging and forest conversion is illegal, according to the laws and regulations of producer countries, yet illegality and corruption remain endemic in many forest-rich countries. And Indigenous Peoples—whose presence is associated with maintaining forest cover, yet whose land rights are often unrecognised—continue to be murdered when they attempt to protect their forests. We actually know how to do this. We have a large body of evidence that shows what works. Brazil, for example, reduced large-scale deforestation in the Amazon by 80 per cent from 2004-2012 by increasing law enforcement, expanding protected areas, recognising indigenous territories, and applying a suite of carrots and sticks to reign in uncontrolled conversion to agriculture, even while increasing production of cattle and soy. The problem is that our current efforts to apply these tools amount to a feather on the brake compared to the brick on the accelerator. 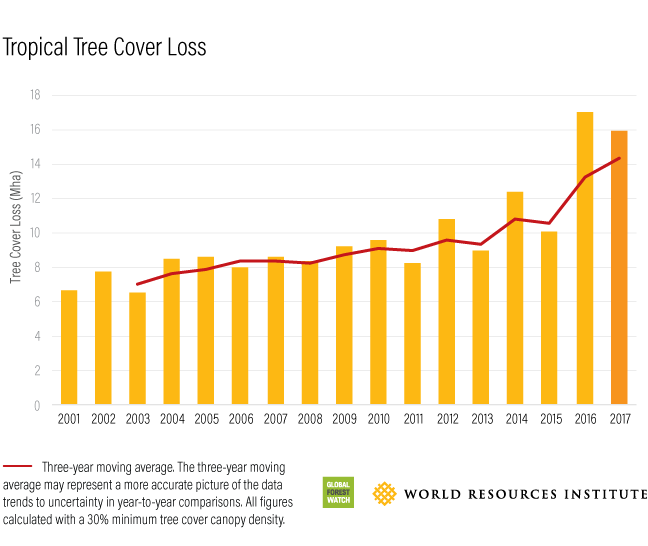 To a certain extent, the bad news in the 2017 tree cover loss numbers reflects collateral damage from unrelated political and economic developments in forested countries. Colombia’s 46 per cent increase in tree cover loss is likely linked to its recent conflict resolution, which opened up to development large areas of forest previously controlled by armed rebel forces. While the doubling of Brazil’s tree cover loss from 2015 to 2017 was in part due to unprecedented forest fires in the Amazon, the uptick is likely also attributable to a relaxation of law enforcement efforts in the midst of the country’s ongoing political turmoil and fiscal crisis. Indeed, it is striking how many of the world’s tropical forested countries have either experienced a recent change in government (Liberia, Peru), are currently in political crises (Brazil, Democratic Republic of Congo), are in the midst of elections (Colombia), or will face elections in the near future (Indonesia). International cooperation on law enforcement can also create domestic incentives for forestry sector reform. In late 2016, Indonesia became the first country to receive a licence to export to the European Union timber verified as legally harvested. By ensuring that its timber was harvested legally, Indonesia secured access for its forest products in a lucrative international market. No amount of international concern about tropical forests will make a difference unless it meaningfully connects to domestic constituencies in forested countries, and changes the incentives that drive deforestation. Preliminary analysis suggests that a significant chunk of forest loss in 2017 was due to “natural” disasters of the sort expected to become more frequent and severe with climate change. Hurricane Maria flattened forests in the Caribbean, and fires burned large areas of Brazil and Indonesia over the last few years. While degradation of forests through logging and fragmentation by roads renders them less resilient to extreme weather events, there is a limit to which forest-specific interventions can be effective in the face of a changing climate. While stabilising the global climate is contingent on saving the world’s forests, saving the forests is also contingent on stabilising the global climate.